When I sit back, close my eyes, and think of fall, a rush of childhood memories come to mind. I think of the fragrant smell of autumn leaves that fills the air, and I remember the warmth from the oven in my mother’s kitchen in the hours before dinner and the wonderful aroma that filled the house. 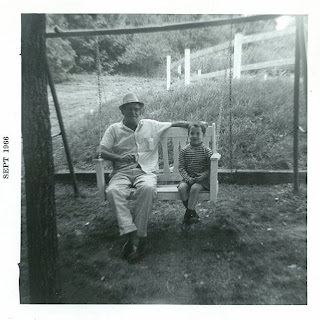 Yep, that's me as a boy, enjoying an early fall day with my Uncle Mundo.One of the great things about being a chef is that if you do your job right and create great recipes, it is possible to stir those types of memories in others with your creations. And that is exactly what I think we have done with our new line of fall specials. Let’s start with our new appetizer, baked Spinach & Artichoke Dip. This appetizer is made from scratch in each restaurant and baked for you to order in our kitchen ovens. It’s filled with spinach, artichoke hearts, onion, cream cheese, Asiago cheese, mozzarella cheese and a dash of Frank’s Red Hot. Try one. Our ovens always have a warm spot for you, just like Mom’s. At breakfast you’ll find our new Mushroom Medley Omelette and with a blend of FarmSource button and portabella mushrooms. We still make every omelette fresh to order with three large Grade A eggs. For lunch we are featuring our new Pittsburgh Turkey Sandwich. The combination of flavors here is outstanding….seasoned fries, smoked turkey, Swiss cheese, and a spicy chipotle slaw, all served between two slices of our fresh-baked Italian bread. Yes, we bake our Italian bread fresh every day in every restaurant (and our six grain, rye, and raisin breads too!). For dinner, give either the returning Chicken Cordon Bleu or the new Smothered Ground Sirloin a try. The chicken is oven-baked to order and topped with thin slices of ham, Swiss cheese, and a hint of white wine butter sauce. The sirloin is char-grilled to perfection, topped with rich brown gravy and farm-fresh green peppers, onions, and mushrooms. Definitely two dishes that will give you that “just like home” heartiness you expect in fall meals. Nothing says comfort like pumpkin pie. Don’t you just love thinking back to all those great Thanksgiving dinners that ended with pumpkin pie? This fall, we will be introducing fresh baked pumpkin bread, pumpkin pie milkshakes, and pumpkin lattes along with our annual pumpkin pies. Try one and bring back a memory. And finally, one of my favorite fall memories is enjoying the fall apple harvest straight from the trees. I’m excited to tell you that we will be featuring fresh Apple Cider and Hot Mulled Apple Cider from Dawson Orchards, one of our FarmSource partners. So there it is; a combination of recipes based around the fall feelings of heartiness, warmth, comfort, freshness, and overall nostalgia. Why don’t you stop at Eat’n Park, give our new fall specials a try, and escape for a little while to the fall memories of your past.